If you have received your race bib prior to race weekend then you are not required to register or check-in on Saturday or Sunday. Simply head straight to the start line at the scheduled time. Please ensure your race bib is attached to the front of your body and visible at all times during the event. Failure to have your race bib displayed may result in a ‘did not finish’ (DNF) being recorded. For any reason you are unable to start or finish you MUST notify race officials your bib number. To acknowledge your achievement, every finisher will receive a race medal when they cross the finish line. All male and female, 1st, 2nd & 3rd placegetters of the Marathon, Half-Marathon, 10km and 5km races will receive a place medal. All Age Category winners will receive a certificate recognising their achievement. 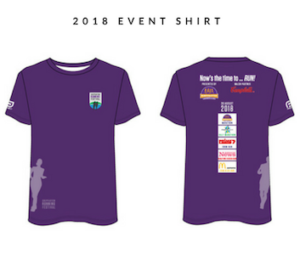 Our Shepparton Running Festival souvenir t-shirt is available to purchase through our registration system. To guarantee your size before race day you must order and pay before 15 July. Additional t-shirts are available for purchase however, it will be first in best dressed or until remaining sizes are sold out. If you have already entered and wish to order a t-shirt access your registration by clicking here. Choose submit email address. An email will be sent to you so you can access your registration. Scroll down to +Add Optional Items, then select your size and pay. Your souvenir t-shirt will not be posted out, it will be available for collection on race weekend. Photographers will be strategically placed on the course, so don’t forget to smile and wave. A photographer will also be positioned at the finish line to capture your moment. Photographs will be available via a link on the website under NEWS to view and purchase. This service is available to all entrants. The baggage drop area is located in a marquee close to the start/finish line. Your race bib number will be your bag identifier, make sure you have your race bib with you when you come to collect your bag. This service is manned however the event manager takes no responsibility for lost or stolen items. Personal music devices are permitted for all race distances. We request that you do not turn your device on until after race start and you keep your volume to an appropriate level during the race. You need to be able to hear the instructions from the starting marshal and assistants on course. Parking restrictions are very relaxed on weekends, however please check the signs and obey the limits.